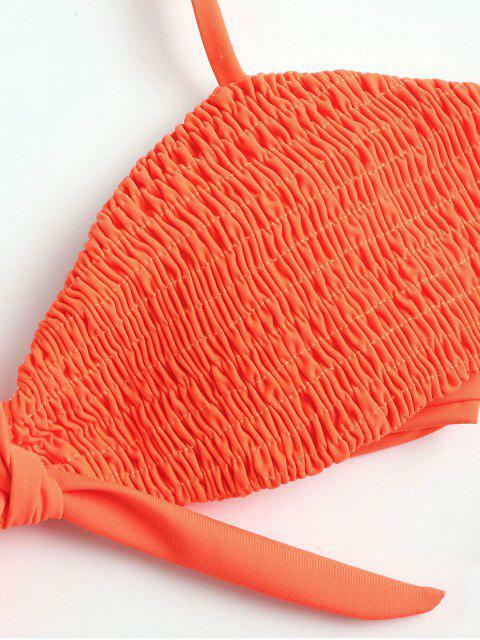 [40% OFF] 2019 Neon Knot High Cut Smocked Bikini In DARK ORANGE | ZAFUL ..
Great matearial and fit. The color is a lot brighter than I expected, don’t really know what I think about that but over all very nice. I normally go with XS or S but went with M. The top fits perfectly even though I have a very small chest and I could have gone with a small for the bottoms. Bright, flattering color and high quality material. Looks just like the picture. We have a series of smocked swimsuits to get in on the fashion trend, and this smocked bikini is our favorite. This solid bright style covers a smocked bra top with knot halter collar and front knot detail, and flirty high cut swim briefs. The bra top has a very lovely knot closure on back. No underwire design for comfortable wear, but removable sponge pads inserted for support.